Mumbai, Mar 2 : If you were wondering why it is so difficult to get tatkal tickets, recent arrests by the Central Bureau of Investigation (CBI) may help you get the answers. The CBI has busted a multi-crore railway ticket booking scam with the arrest of four persons, who ran a ticketing business in Wadala. The accused used over a hundred bogus personal user IDs with the railway's proprietary software to book confirmed tickets en masse, seconds after bookings would open, depriving genuine commuters of tickets. A ticket-booking agent is allotted only one user ID, but the accused allegedly accessed the IRCTC portal with simultaneous logins. Cops are trying to ascertain how exactly they procured the software, and the extent of their ill-gotten gains. The accused, identified as Mehtab Khan, Mehboob Malik, Santaram Yadav alias Pappu and P Naga Kumar, have been booked for cheating and criminal conspiracy. The agency suspects the men have also violated the Information Technology Act, 2000. While Khan and Pappu were arrested yesterday, Malik and Kumar were nabbed on Wednesday. Khan, Malik and Naga Kumar have been remanded to judicial custody till March 15, and Pappu has been remanded to police custody till March 12. In the remand application for the accused, Inspector Girish Soni said, "This is a big racket run by the accused persons due to which the general public is deprived of their right to get railway tickets booked under the tatkal scheme. 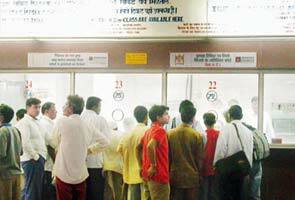 Meanwhile, the accused persons are selling the said railway tickets at exorbitant rates to the public." To book the tickets, Khan used the software, which is capable of getting the railway system to accept around 10 railway requisition forms simultaneously. He would access the website through his several fake IDs just after bookings opened for the day at 8.00 am. As anyone who has tried to book a tatkal ticket knows, the limited seats are sold out within minutes after the bookings open. With the software, Khan could book multiple tickets in seconds. A railway source said, "The public has to wait to be able to make reservations, but the railway's own software does it much faster. If the person in question had access to the software, booking tickets would be a breeze." At the initial stage of investigations, the CBI is yet to ascertain whether the accused kept the profits made by selling the base price of the tickets, in addition to the inflated rates they sold them at. Sleuths will also look into how the accused managed all user IDs to hack into the system. According to investigations, Malik supplied the software to Khan and Kumar. He himself acquired the software from Pappu, who in turn had acquired it from Uttar Pradesh-based Salman Ahmed, who is yet to be arrested. The CBI is now in the process of figuring out how many other ticket agents and travel agencies the software was supplied to. "The matter is under investigation. We cannot share details at this stage," said Rishi Raj Singh, joint director of the CBI. S V Ingale, chief commercial manager, Central Railway said, "No CBI officials have contacted us in this regard. What the accused were doing seems incredible." The railways periodically issue licenses to booking agents. These agents, called Rail Travel Service Agents, are officially authorised to vend tickets to the public. Another variant of this is the Jan Sadharan Ticket Booking Service agents. These are persons with their own independent stalls who charge a small commission fee for every ticket they book. Both kinds are provided single login IDs to access the system, but Khan and his cohorts had multiple login accounts.